CEREC stands for Chairside Economical Restoration of Esthetic Ceramics, or CEramic REConstruction. 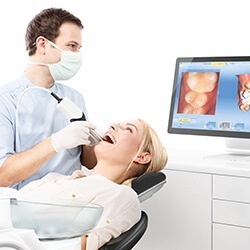 Despite being a mouthful, the way CEREC works is actually very easy to understand. It uses a highly-advanced 3D scanner in combination with a CAD/CAM program to make crowns in only an hour, as opposed to a week using the traditional method. One of our doctors will remove the damaged portion of your tooth and prepare it to fit the crown. 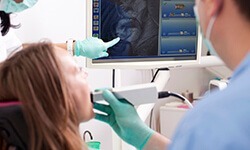 He will use the scanner to take a high-quality 3D image of your tooth and surrounding dental structure. This image will be given to the CAD/CAM program to design and mill your crown all in office while you sit comfortably in the dentist’s chair. Finally, your brand new crown will be placed onto your tooth. Faster: Since everything is done in office, you can get a crown designed and placed in only an hour. The traditional method usually takes a week or more just to get your permanent crown fabricated. Your time is valuable, and that’s why we help you save it. More Comfortable: Remember the gooey and messy dental impression material that you’ve had to use in the past? Thanks to the 3D scanner, it is no longer needed. Not only does it make the process more comfortable, but it also creates a much more accurate model of your tooth, which will help make a crown that will fit better, and therefore last longer. Higher- Quality Crowns: CEREC crowns are made from 100% dental porcelain. This material is the most similar to natural tooth enamel, meaning that your crown will not only be stronger than a traditional metal one, but look better as well. Dental porcelain can be specially shaded to match the rest of your smile, and even reflects light similar to real enamel. The end result is a tooth that blends seamlessly with the others that you can also rely on day to day. How Can I Get a CEREC Crown? If you’d like to get your damaged teeth repaired in the quickest, most effective way possible, you simply need to make an appointment with BGH Dental. This will give one of our doctors the chance to examine your mouth and gums to determine if a crown is the right solution for you. If it is, we can almost immediately start giving you a crown. CEREC allows us to help more people while saving them weeks of time, and we’re proud to use the most advanced technology available to improve our patient’s results and experience with us. If you have damaged teeth and want to get them fixed today, please give us a call.